The plant you will receive is growing in a 4" pot and is about 8" tall. There are multiple plants in the pot The white coffee flower has five petals and a scent resembling that of jasmine The coffee tree requires temperature of 65-80 degrees F The plant you will receive is growing in a 4" pot. Picture is a example of one of the plants that are shipped out. The original home of the coffee plant is Africa. The first coffee plant of economic importance was Coffea Arabica. It grows to the height of 2-3 feet but the cultivated plants are cut to the height of 1-2 feet to get more width. The leaves of the coffee are lustrous dark green with lighter underside. The flowers emerge from the branches together with the leaves. The white coffee flower has five petals and a scent resembling that of jasmine. The coffee berries are cherry-sized and green at first, turning dark red later on. The ripening takes eight months. The coffee plant can simultaneously have flowers and berries in all stages of development. 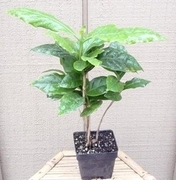 The coffee tree requires temperature of 65-80 degrees F. Thus, the coffee tree is a tropical plant. The plant you will receive is growing in a 4" pot and is about 8" tall. There are multiple plants in the pot.